Warren Moon attended the University of Washington and was named Most Valuable Player in the 1978 Rose Bowl victory, prior to joining the Edmonton Eskimos. Warren Moon would spend his entire Canadian career with the Eskimos. In his rookie season, as the backup quarterback, he would replace Bruce Lemmerman, completing 89 0f 173 passes for 1,112 yards and 5 touchdowns and was Edmonton’s nominee for the Schenley Most Outstanding Rookie award. 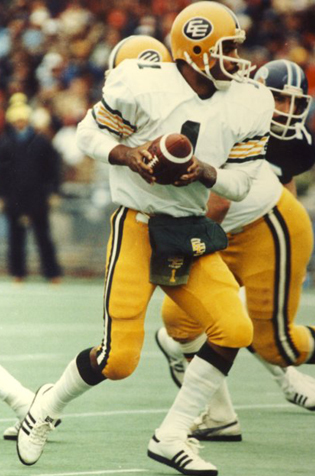 In 1980, he became Edmonton’s starting quarterback and led the Eskimos to their third straight Grey Cup. He would lead Edmonton to two more Grey Cups in 1981 and 1982 as part of their five year Grey Cup dynasty, which lasted from 1978 to 1982. Warren Moon ended his CFL career in 1983 as the league’s leading passer with 380 completions of 664 attempts for 5,648 yards and 31 touchdowns. For his efforts, he was named to the CFL All-Star team, Western All-Star team and won the Schenley Award for the Most Outstanding Player. Moon has been named to the Edmonton Eskimos Wall of Fame and is a member of the Pro Football Hall of Fame.